"I will not allow discrediting the work of anti-corruption bodies." President Petro Poroshenko says that political interference in the work of anti-corruption bodies is unacceptable and promised to protect them from discrediting. "I will not allow any threats of political interference in the activities of anticorruption institutions. On the contrary, I believe that it is necessary to accelerate the appointment of the audit; it is necessary to ensure effective protection from any political interference of politicians in the work of the NABU and politicization of the work of any law enforcement agencies willing to influence politics. I believe that these are the right approaches," Poroshenko told the media after talks with Lithuanian President Dalia Grybauskaitė. 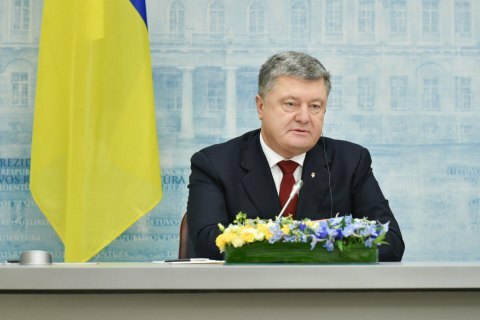 The president said that over the entire time of the work of anti-corruption agencies in Ukraine, neither he nor the authorities had interfered in their work. "Their work is carried out and will be carried out exclusively in the legal field. I emphasize that their activity is crucial to overcoming corruption in Ukraine, and I will not have any discreditation of the work of anti-corruption bodies, as well as all law enforcement agencies in Ukraine," Poroshenko stressed. Poroshenko also noted the importance of providing information on the work of anti-corruption bodies after the investigation is completed "because there is a constitutional principle of presumption of innocence." According to Poroshenko, the effectiveness of all anti-corruption bodies should be measured not by the number of press conferences, but by the number of corrupt officials who will be imprisoned. "We consider it unacceptable when the leaders of any law enforcement agencies, including antiсorruption ones, begin to play in the political field. They must be independent, they must be protected from any political influence. We have to distinguish when we are talking about the independence of institutions and when we are talking about individuals. Here our position is absolutely fundamental - the independence of the institutions must be guaranteed," concluded the president. Earlier, National Anticorruption Bureau (NABU) said a "big plan" is implemented in Ukraine, the main purpose of which is the destruction of the NABU and the Specialized Anti-corruption Prosecutor's Office. The United States, the European Union and the United Kingdom issued harsh statements in NABU's defense, accusing the Prosecutor-General's Office and the Security Service of frustrating the operation of the bureau and interfering with its work. On December 6, the parliament was to discuss a bill on the dismissal of the director of NABU without an audit. The bill, co-authored by heads of factions Petro Poroshenko Bloc and People's Front. The document was promptly removed from the agenda after the sharp reaction of the West, in particular the IMF and the World Bank. The European Parliament also stated in support of NABU and called on Ukraine to consolidate.